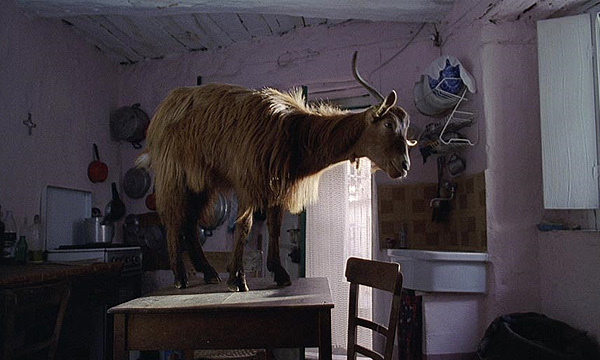 Winner of the Golden Puffin award at the Reykjavík International Film Festival 2010 for the category New Visions and also of the FIPRESCI award, Le Quattro Volte (The Four Times) is almost a philosophical essay in form of a narrative film. In reality, the narration is very minimal, to the point the film almost seems to merge with the documentary genre. Life is a circle and every living being is part of it. 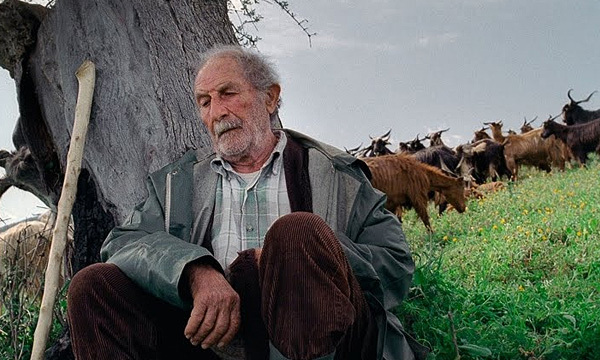 In Frammartino’s film every world is connected to the other: human is not alien to animal and animal is in communion with vegetable; from vegetable to mineral it’s just a short step. Accepting Nature is in the order of life; man cannot escape death, but death is just a passage from a state to another. Set in the hills of the southernmost regions of Italy, in rural Calabria, Le Quattro Volte features very essential storyline and dialogue. At the beginning the focus is on an old shepherd (Giuseppe Fuda): the man is sick and alone, his only companions being his dog and his goats. Everyday the shepherd leads the goats to the pastures, but his health conditions are making the task overwhelming for him. 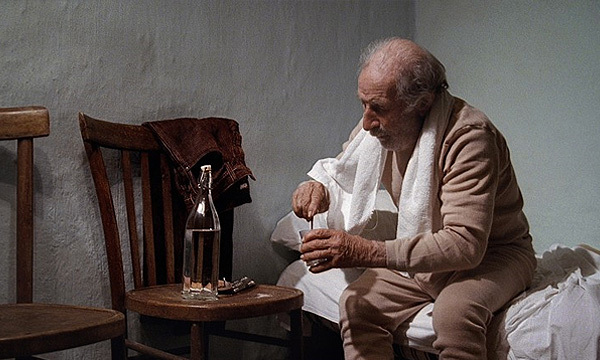 In order to cure his illness, the old man drinks daily a mixture of water and dust collected from the local church. After the shepherd’s disappearance, the story shifts its focus to the animals, then to the vegetable world, and finally to minerals. At this point the circle is ready to start over. As I mentioned before, the dialogue is totally absent, if you except a few words uttered or mumbled now and then by characters but almost inaudible. Words in themselves as carriers of sense are never discernible. Under this point of view, Frammartino’s Le Quattro Volte is the nearest contemporary relative of silent cinema. However, the film is rich in verses and noises from the natural world that are used in an extremely expressive way, forming a varied and articulate textural soundtrack. Human language is treated as part of the whole, bearing no more importance than the cries of a goat lost in the hills or the crackling of burning embers in a brazier. Frammartino’s style is simple, collected and dispassionate. The vision of the author never gets in the way with a pedantic tone to impose judgement on the spectator. The cinematography is bare; the settings are raw representation of the deepest Southern Italian province. Unnecessary elements are not given any space; even when representing what’s absolutely necessary, the general tone is unobtrusive and controlled. The camera movements are reduced to the minimum, although some scenes denote a complexity which is only possible with a great degree of mastery of the cinematic art. The beauty of the film resides in its lyrical but at the same time sober depiction of Nature’s mechanics. Not a single element goes unredeemed. Nature has its times and, as the film shows, it works at a very slow pace. Repetitiveness is an important component to it: life on a larger scale is a circle including everything, but on smaller scale it also proceeds by cyclical iterations (day and night, seasonal alternation, etc.) which constitute the known reality and the reference points of all living beings. I saw this movie the other day, and he makes me think in other contemplative authors like Victor Erice and Abbas Kiarostami.Now in Spain we have three italian films in some screens: this one,”La cosa piu bella” and “Manuale d”amore 3”.For some strange reasons everyday is more difficult to see italian cinema in Spain.I can”t remenber having the chance to see three italian movies in the same month for years.What the hell happens with Italian cinema? After having some of the best directors of all times( Fellini, Visconti,Pasolini,De Sica,Antonioni,…to name only a few),now the situation is totally different: in Spain you can only see some things of Marco Bellocchio( a great director, in any case),Matteo Garrone,Paolo Sorrentino,the last and beautiful picture of Ermanno Olmi “Cien clavos”,and other good films ,like “Caterina se va a Roma “and “La espectadora”.It”s easier to see asian films than to see films of neighbours countries like Italy or France.Sometimes I had the feeling of knowing a lot about asian cinema ,and ignore almost totally the most interesting and influential european movies of the moment. Sadly, great Italian cinema is a thing of the past, like art and music. Italy is in a stage of decadence, funds for cultural activities have been drastically cut, there is a lot of corruption in the industry, there are laws going against independent cinema to protect the interests of a few wealthy producers and distributors, and I am not sure how long it will take for italian cinema to get back on its feet. It’s years of nurturing a corrupt system that goes by favor and not by actual worth that led to this, mainly. Long story, but anyway it’s unlikely there will be significant changes for a long time, and if you will get to see films like Frammartino’s, it will be a few sporadic exceptions now and then (and note that Frammartino’s film is not an Italian production, it was made in co-production with Germany and Switzerland). That’s why you don’t get to see Italian films, because most are garbage and unfit for export. Not three but four italians films in the spanish screens this month: this week the last film by Gianni Di Gregorio, the author of “Vacaciones de Ferragosto”, a good film ,in my humble opinion.